Situated in La Bresse, this hotel is steps from La Bresse Square and La Bresse-Hohneck. La Bresse Ice Rink and La Bresse Brabant Ski Area are also within 2 mi (3 km). Located near the slopes, this La Bresse hotel is in the mountains, within a 10-minute walk of La Bresse-Hohneck and La Bresse Square, and close to winter sports such as cross-country skiing and skiing lessons. La Bresse Ice Rink and La Bresse Brabant Ski Area are also within 3 mi (5 km). Situated in a regional park, this hotel is within 1 mi (2 km) of La Bresse Ice Rink and La Bresse-Hohneck. La Bresse Square and La Bresse Brabant Ski Area are also within 3 mi (5 km). 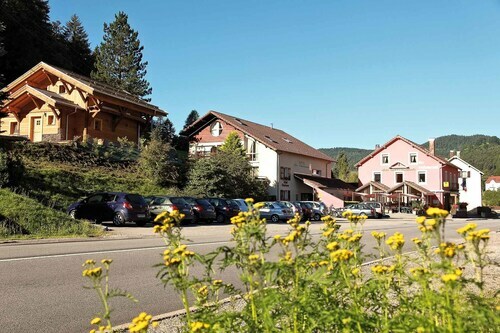 Located near the slopes, this La Bresse hotel is within 1 mi (2 km) of La Bresse Square and La Bresse-Hohneck and close to winter sports such as cross-country skiing and snowshoeing. La Bresse Brabant Ski Area and La Bresse Ice Rink are also within 3 mi (5 km).